Marches from the east and west are slated to converge at 12:30. The procession that started on July 3 in the east of Ukraine at Svyatohorsk Lavra (monastery) and on 9 July at the Pochayiv Lavra in the west, have made it to Kyiv. The marchers are transported to the European Sq. in the downtown Kyiv by buses. At 12:30, a solemn meeting of the two processions is slated to be held on European Sq..The ceremony will be headed by heads of the two monasteries. At 13:00, the marchers will participate in a solemn prayer service at St. Volodymyr's Hill, which will be held by the Primate of the Ukrainian Orthodox Church (Moscow Patriarchate) Onufriy. At 13:30 the gathering will march to the Kyiv-Pechersk Lavra. The procession will end in an all-night vigil at the monastery. In the center of Kyiv, the installation of metal detectors resulted in the accumulation of crowds of people whose offices are located inside the restricted access area. The security measures provoked outrage from people, who say they have not been warned beforehand. At least some of them have no IDs on them. In the meantime, law enforcement officers carefully check the bags of individuals wanting to get in the restricted access zone, and demand their IDs. Previously, the Speaker of the Verkhovna Rada, Andriy Parubiy said that the procession to Kyiv was organized by the Kremlin to destabilize the situation in the country. Law enforcement officials have pledged to avoid disturbances. 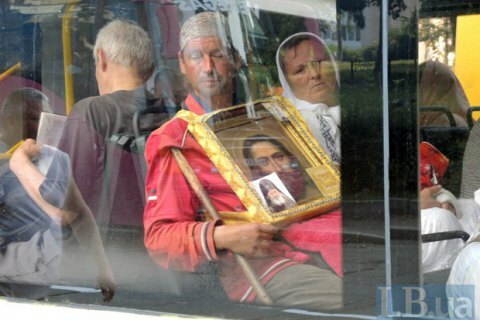 Prosecutor-General Yuriy Lutsenko has said that all pilgrims will have to pass through metal detectors.